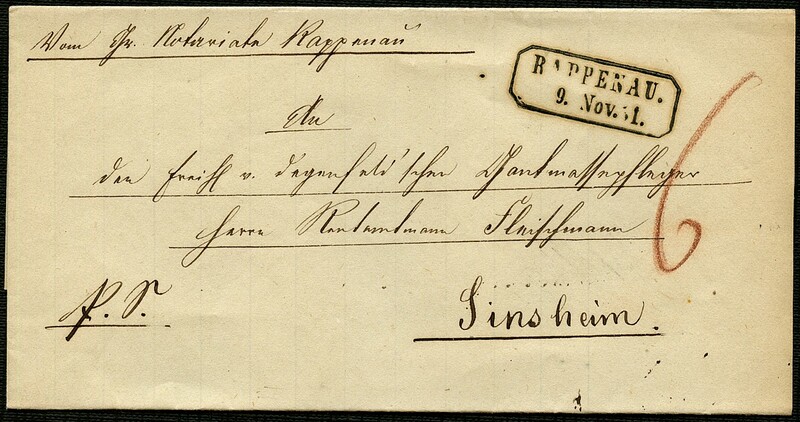 Baden 1851, Vorphilabrief von Rappenau nach Sinsheim, ohne Inhalt. Entwertet mit schwarzem, sauberem und klarem Rahmenstempel RAPPENAU. 9. Nov.51.. Rückseitig Ankunftsstempel Zweizeiler SINSHEIM 9. NOV.. Taxvermerk in rot. Saubere Gesamterhaltung! 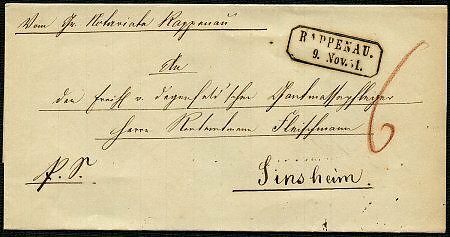 Baden 1851, pre philately letter from Rappenau to Sinsheim, without content. Tied by black, clean and clear rectangle cancel RAPPENAU. 9. November 51. . Reverse arrival postmark two line cancel SINSHEIM 9. November . Rate marking in red. Clean overall condition!